Police are probing a serious assault in the Craigavon area. A 37-year-old suffered injuries to his chest and arms during the assault on Sunday morning. A PSNI spokesperson said: “Shortly before 2.55am on Sunday, 17 January, a 37-year-old man was assaulted when he opened the door of his flat in Drumgor Heights. “It is believed the assailant was male. 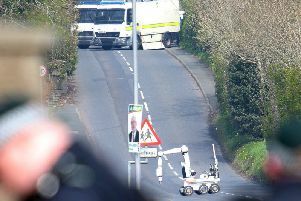 “The man sustained injuries to his chest and arms,” said the PSNI. Detectives are asking anyone who witnessed any activity in this area around this time or anyone who has information in relation to this incident to contact them on 101, quoting ref: 198 170116. If you prefer to provide information without giving your details you can contact the independent Crimestoppers charity anonymously on 0800 555 111.